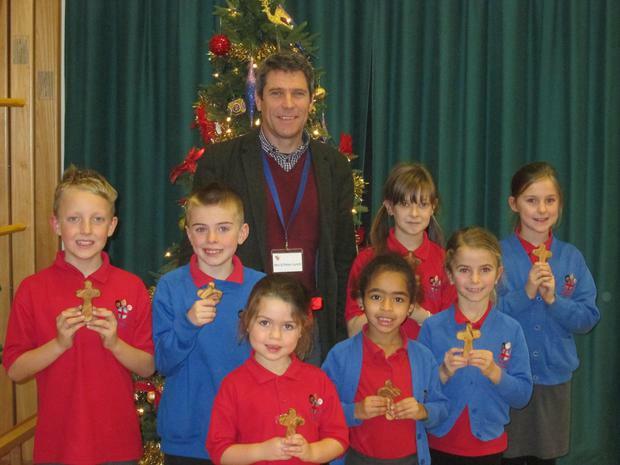 Rev' Lynch, known as Mr Peter to the children, joined us for our celebration worship on Friday 12th. He presented Year 3 children with their certificates of participation in the Family SEAL programme which was planned and led by Mrs Grother as part of her work in school. The children enjoyed their weekly activities with family members, helping them to make a successful transition from KS1 to KS2. Peter also blessed the Holding Crosses ready to go into every class for the children to use. Each Holding Cross has been individually hand-crafted in the Holy Land, using the finest olive wood. It has been uniquely designed to fit comfortably in the palm of the hand. It has no special power. It is simply a reminder of the price Jesus paid so that all may come to know the love of God. It is especially useful as an aid to meditation and silent prayer.